I think a fanlisting is best explained by a quote from the TFL.org site "A fanlisting is simply an online listing of fans of a subject, such as a TV show, actor, or musician, that is created by an individual and open for fans from around the world to join. There are no costs, and the only requirements to join a fanlisting are your name and country." The Belgian detective Hercule Poirot was created by Agatha Christie, and her stories have been adapted, in many forms, numerous times. In 1989 the television series, to which this fanlisting is dedicated began. 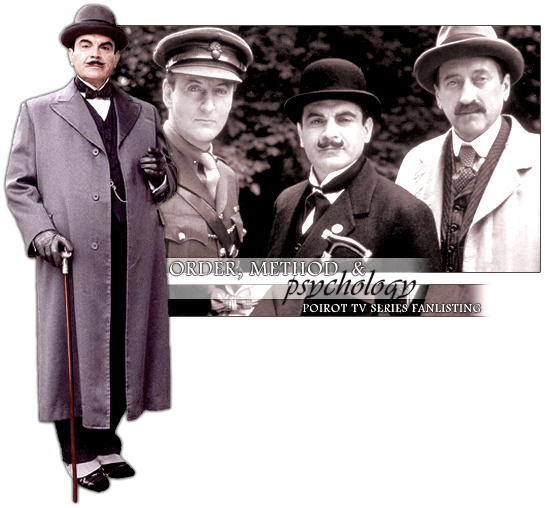 It features David Suchet in the title roles with Hugh Fraser as Captain Japp, Philip Jackson as Chief Inspector Japp, and Pauline Moran playing Miss Lemon. What makes this version so appealing, especially to Agatha Christie fans, is how failthful it brings to life original books. So far 63 stories have been adapted, and David Suchet hopes to film the remaining tales to make the canon complete. For more information on the series, visit its IMDB entry. So if you want to proclaim your esteem for Poirot the TV series to the world, this is the place to be.